It is our family's last full week of summer vacation. The final few school supplies are being purchased after visits to multiple stores. We are finally doing the activities we planned to do earlier this summer, but never got around to doing them -- i.e. hitting golf balls at the driving range. The calendar is beginning to fill up with ice cream socials, meetings, and other events. 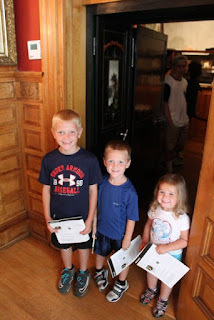 My wife and I are not overwhelmed yet, but we know the beginning of the school year will be hectic. I am thankful we were able to carve out time to celebrate Alice Provensen's birthday despite all the end-of-summer responsibilities and emotions. 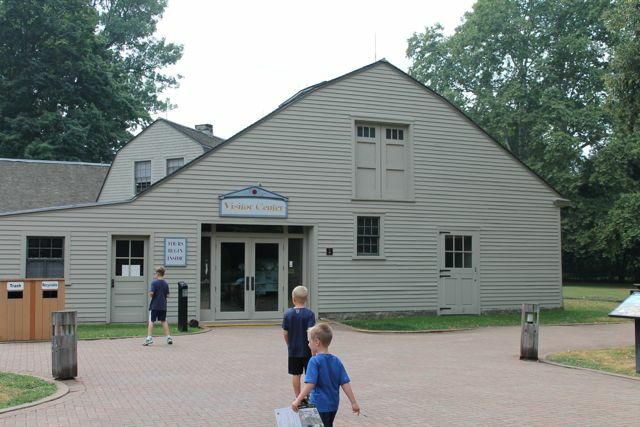 Alice Provensen has published over fifty books including The Year at Maple Hill Farm, A Day in the Life of Murphy, and The Master Swordsman and the Magic Doorway: Two Legends from Ancient China. As a child Alice's mother always made sure she had paints, brushes, and art supplies. In the sixth grade, Alice was awarded a scholarship to the Art Institute in Chicago to take art classes on the weekends and in the summer. (LJworld.com). In 1943, after college at the University of California, Alice began working in the animation department at Walter Lantz Studios, the studio responsible for creating the Woody Woodpecker cartoons. While working there she met, Martin Provensen who previously worked at Disney, but was assigned to Walter Lantz Studios to make training films after joining the Navy. Alice married Martin the following year in 1944. 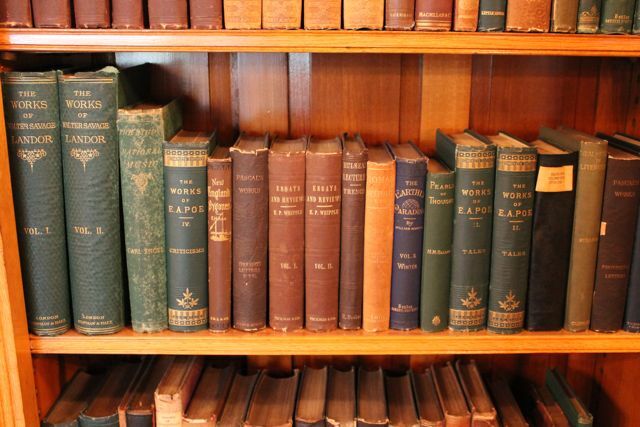 Over forty of Alice's books were created with her husband. The first book they illustrated together was Fireside Book of Folk Songs in 1947. Shortly after this book, they began working for Golden Books. They published The Fuzzy Duckling by Jane Werner Watson and The Color Kittens by Margaret Wise Brown in 1949. The Provensens also created the iconic Tony the Tiger character for Kellogg's Frosted Flakes which was introduced in 1952. Alice Provensen's career has been full of awards and recognitions. In 1982, she and Martin received a Caldecott Honor for A Visit to William Blake's Inn: Poems for Innocent and Experienced Travelers by Nancy Willard, a book that also received the Newbery Medal. Two years later, they received the Caldecott Medal for The Glorious Flight: Across the Channel with Louis Bleriot. Their books landed on the New York Times Top Ten Best Illustrated list seven times; The Animal Fair (1952), The New Testament (1953), The First Noel (1959), Karen's Curiosity (1963), The Charge of the Light Brigade (1964), The Mother Goose Book (1976), A Peaceable Kingdom: The Shaker Abecedarius (1978). Alice received one additional mention on the list for Punch in New York (1991) which was published after Martin's death in March, 1987. In 2010, Alice and Martin were recognized with a lifetime achievement award from The Society of Illustrators. Alice described her partnership with Martin, "We were a true collaboration. Martin and I were really one artist." (Today's Inspiration). Alice has published seven children's books on her own including The Buck Stops Here: The Presidents of the United States and My Fellow Americans: A Family Album. As an Ohioan, I feel very blessed to have many presidential historical sites within our state. 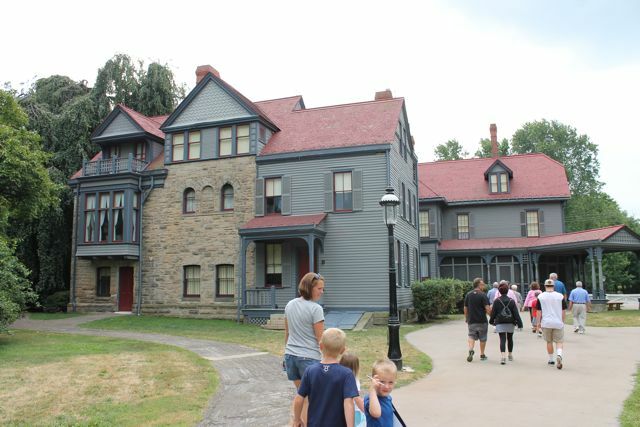 My family visited the President William McKinley Presidential Library and Museum in Canton, Ohio when we celebrated Judith St. George's birthday in 2014. This year, I wanted to bring to life Alice Provensen's The Buck Stops Here: The Presidents of the United States with a visit to another presidential site. 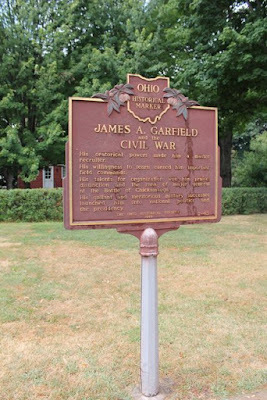 We decided to visit the James A. Garfield National Historic Site in Mentor, Ohio. 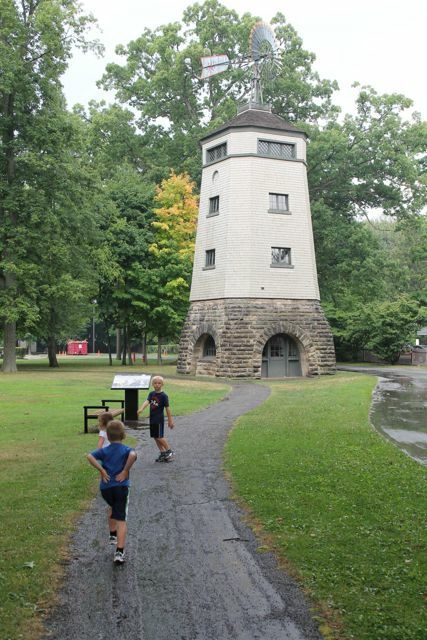 Next to the Garfield home, a large Windmill greets you as you drive to the parking lot. This windmill was used to pump water to a storage tank in the house. James A. Garfield was the 20th president. 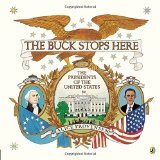 In The Buck Stops Here: The Presidents of the United States, Alice Provensen presents each president with a detailed illustration full of facts and a short rhyme. My boys were excited to find out what awaited them inside the Visitor's Center. Inside we found a small museum dedicated to the life of James A. Garfield. We learned that Garfield fought in the Civil War, served as a congressman for 17 years, and was shot by Charles Guiteau after only 4 months as President. 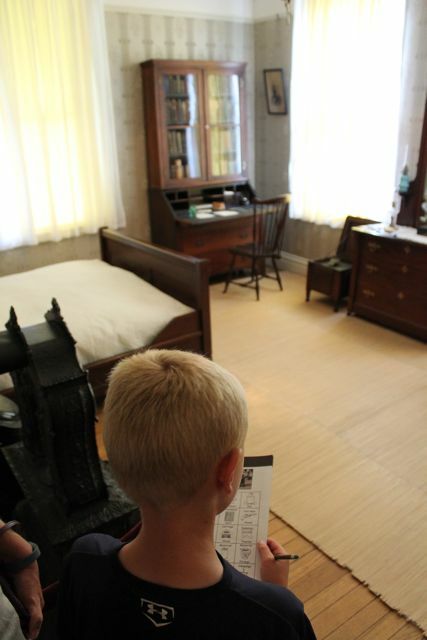 My children played James A. Garfield Bingo throughout their visit. 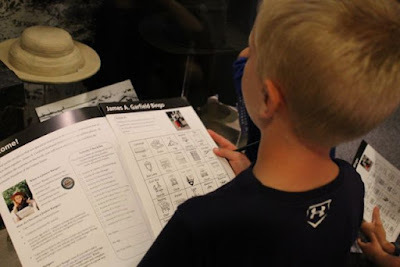 This activity was provided by the National Park Service Junior Ranger Program. 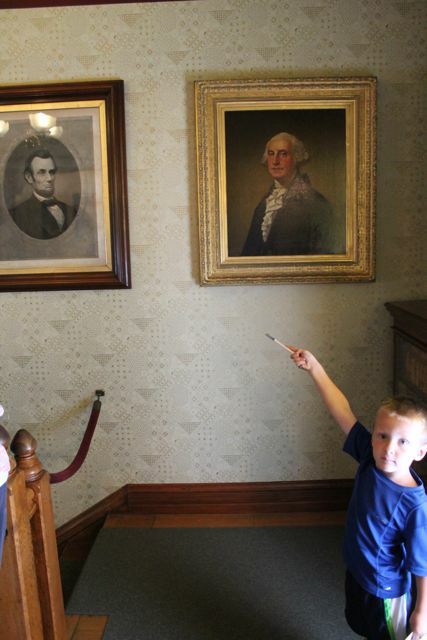 We decided to take a guided tour of the home. 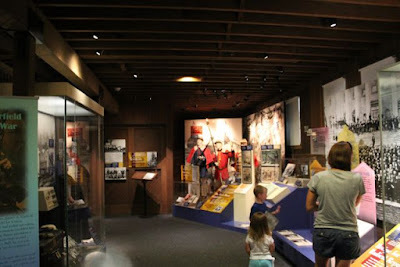 It cost $7/adult and children under age of 16 were free. 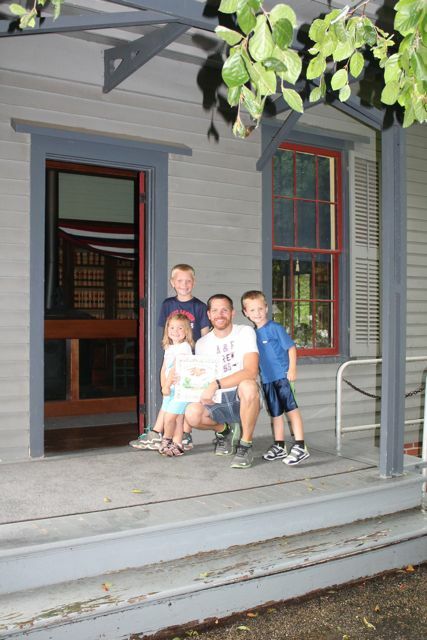 On this porch, James A. Garfield gave many speeches during his campaign. My son pretended he was giving a speech to hundreds of voters. The first bedroom we saw was downstairs. It was used by James and his wife Lucretia during the warm summer months. This beautiful fireplace screen was in Eliza Garfield's bedroom. Eliza was James A. Garfield's mother who lived in the home and also in the White House during his brief term. 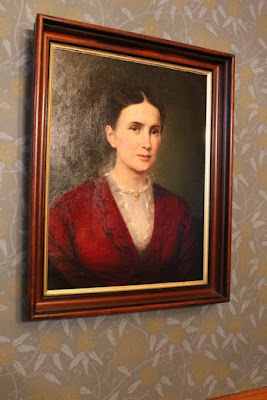 This portrait is of Lucretia Garfield. After James' death, Lucretia added onto the home with money from public donations to preserve a memory of her husband. 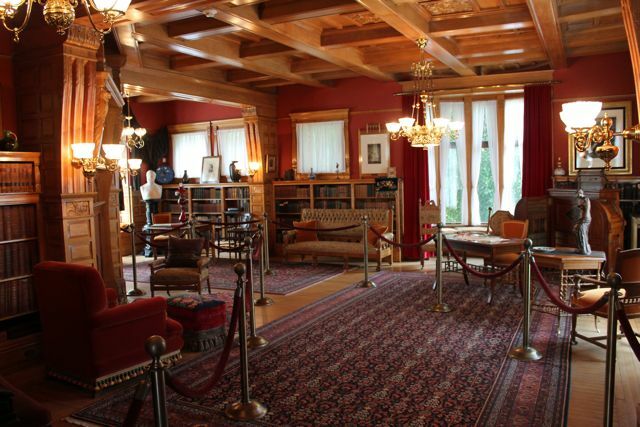 The addition to the home included the first ever President Memorial Library. 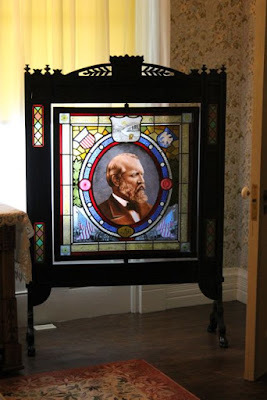 James A. Garfield and his family loved to read. 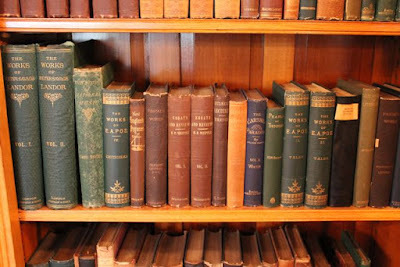 Just a few of the books in the library. Lucretia also added a vault to preserve all of James' important papers. James A. Garfield had a "man cave"! 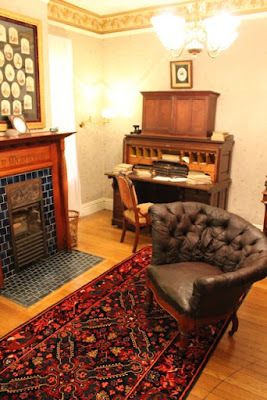 The focal point of the room was his reading chair. 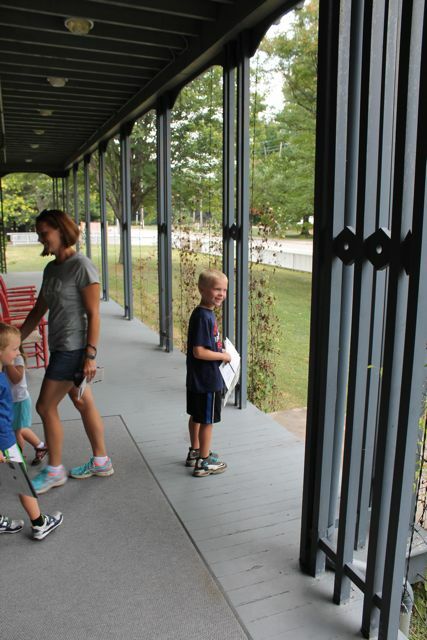 Our visit concluded with this photo on the porch of the campaign office. 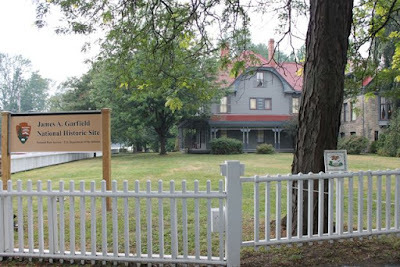 All of us were impressed with James A. Garfield Historic Site and would recommend a visit. We hope you are enjoying your final days of the summer with your children (if they haven't gone back to school, yet). We wish all of you a successful start to your school year.